All words and photos by Tracy Clayton. Hip-hop heads showed up to a sold-out show at the Black Cat to pay tribute to the legendary producer J. Dilla. Since Dilla’s death in 2006 after complications from lupus, I’ve been to many Dilla tribute shows. This one at the Black Cat last Friday felt the most genuine, the most organic. Local acts from D.C. and Baltimore accompanied by the live band J Laine & the Players covered Dilla hits produced for such acts as Pharcyde, Mos Def and Slum Village. Doors opened at 10 p.m. and Talib Kweli hit the stage sharply at midnight. Kweli’s set was short and he often stumbled on his verses, as if he were spitting these classic bars over Dilla blessed beats for the first time. 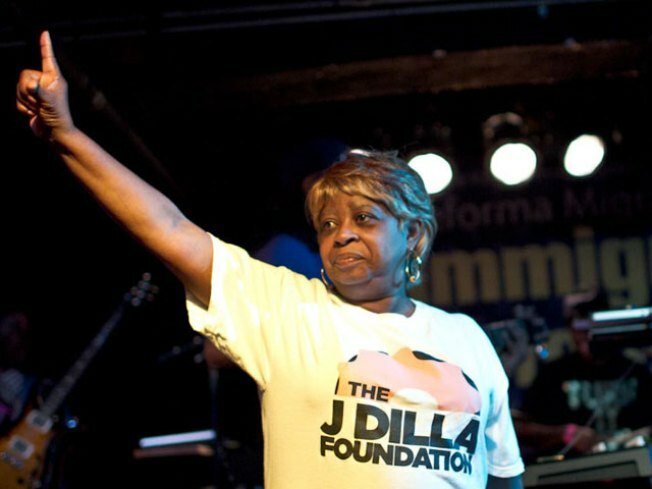 Dilla’s mom, affectionately known in the hip-hop community as Ma’ Dukes, sat on the stage for most of the show bobbing her head to her late son's music. A great night for D.C. hip-hop, Dilla was definitely in the building.